This stunning electric guitar, which sports a single Florentine cutaway, is built with the highest quality in mind. It has a highly figured Brazilian mahogany body with a beautifully carved birseye maple top and a highly figured quilted maple back. Its Indian rosewood neck, blood wood fingerboard and white pearloid pick guard provide a striking contrast to its vintage amber stained body and enhance its natural beauty. 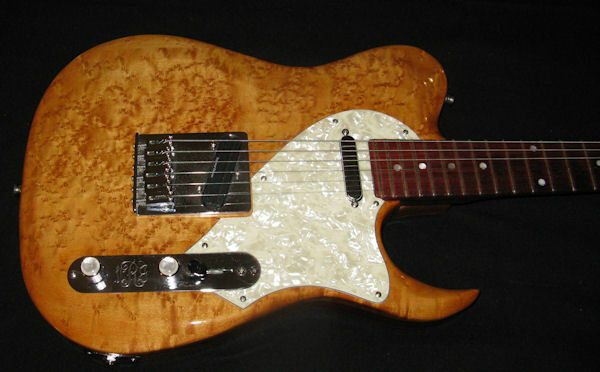 It is fitted with a Seymour Duncan STR-1 single-coil pickup in the neck position and a Seymour Duncan 'Hot Rails' mini-humbucker pickup in the bridge position. This pickup configuration, together with the choice of wood used in its construction, produce warm, fat and powerful vintage tones with maximum sustain. This is truly a high class instrument in every sense. Come! See and hear this Red Hot Blues/Rock Powerhouse at the 2012 Montreal Guitar Show. Brazilian mahogany body, 5/8 inch thick, beautifully carved birdseye maple top and 1/4 inch thick quilted maple back. Satin-finished Indian rosewood neck, built for speed, has blood wood fingerboard white pearl dot inlays. 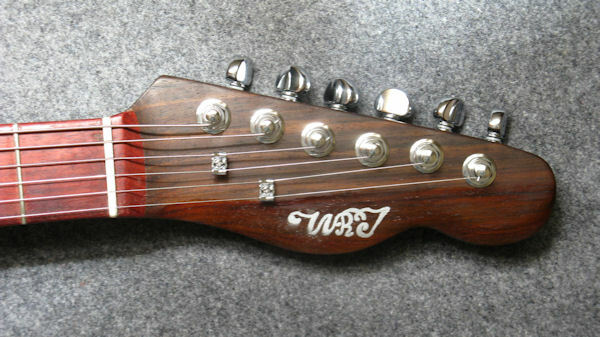 Two-way adjustable 'Hot Rod' internal truss rod for maximum stability. Seymour Duncan STR-1 neck pickup and Seymour Duncan 'Hot Rails' mini-humbucker bridge pickup. 3-way pickup selector, master volume control and master tone control, with push/pull switch for coil-tapping. Pickup cavities and control cavity thoroughly shielded with 2 coats of conductive shielding paint for noise-free, high-quality performance. High quality white pearloid pick guard, chrome control plate and matching control knobs. 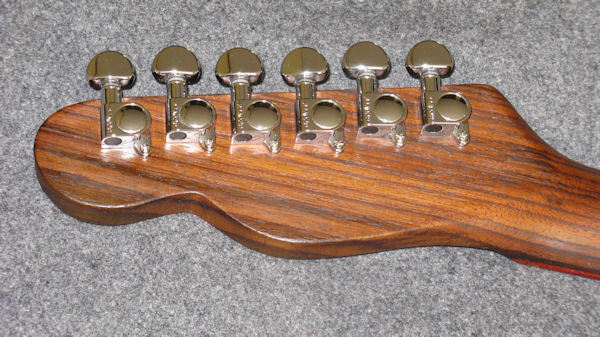 Gotoh chrome-plated brass bridge with 6 individual, fully adjustable saddles. Grover 'mini' tuning machine heads with 14:1 gear ratio. Transparent Deep Vintage Amber, spray-finished with ColorTone Waterbased, high gloss professional guitar lacquer.